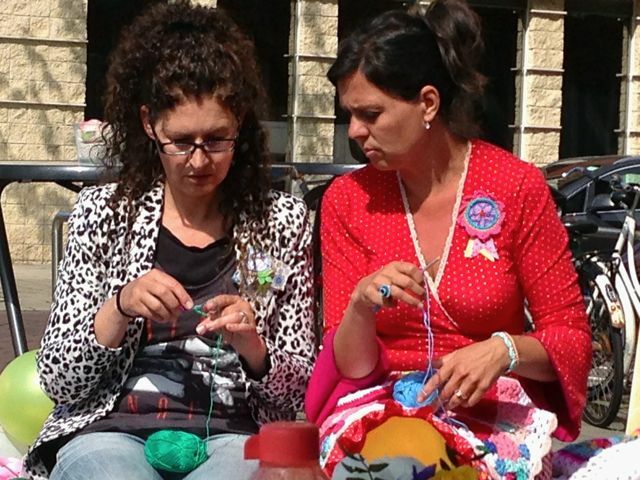 Colorful Claire and Saskia shared their crochet knowledge with us this day. Chalk board picture from Maaike at CreJJtion. 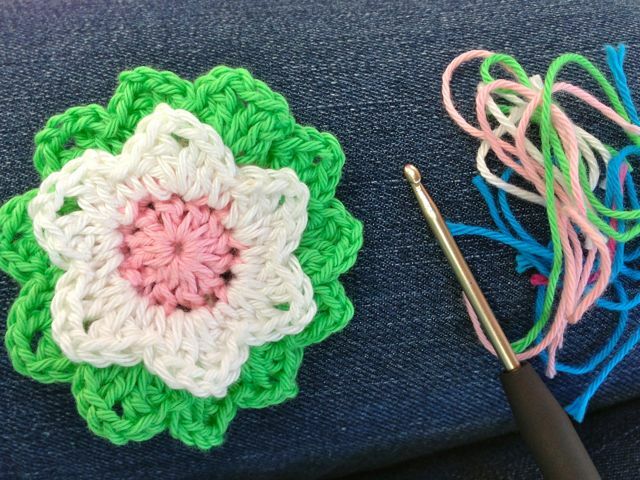 This was Saskia's contribution to the work shop, a pretty double layered flower. Find the tutorial here. Claire (right) is hooking along and guiding one of the crochet ladies in the work shop. How lovely it is to be in the company of people with the same passion as yourself. 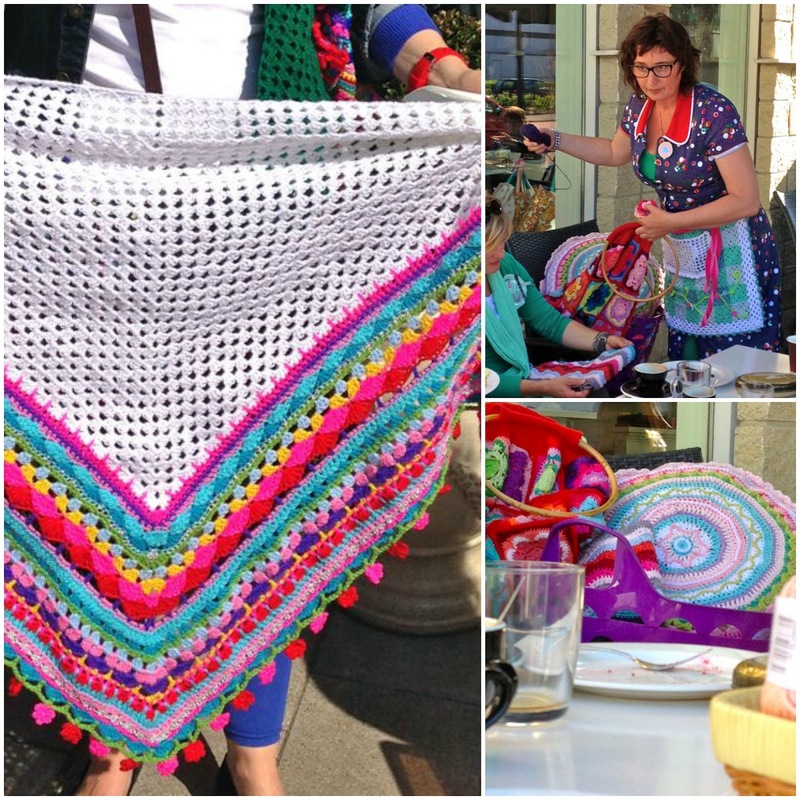 This wonderful shawl was made by Marlies at T-jonge. Small pictures: Saskia with some of her creations. I rented a bike at the hotel and made my way to tram 24 and 16 to take me to the Olympic Stadium. I walked along the Stadium trying to find this very special creative event I came for. With butterflies in my belly I stopped to look at my reflection in a glass door, correcting my hair making sure I looked representable... Vanity... And then I noticed two colorful girls in the background in my reflection... I turned around and there it was, the Create n' Date event. I walked over and instantly felt at home. 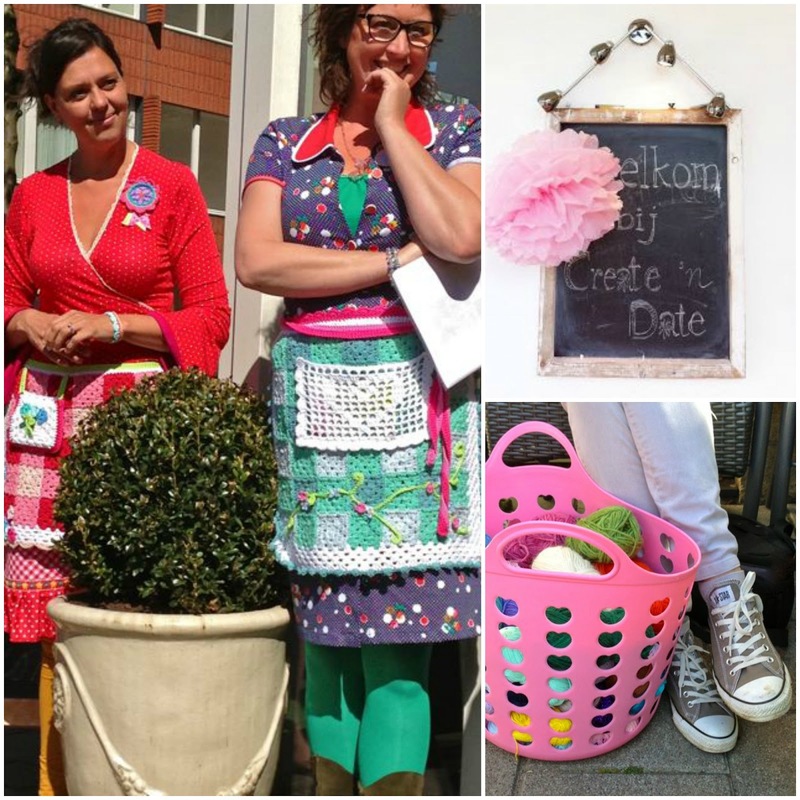 The girls I saw was Claire from Haken en Meer and Saskia from Haken bij Saar en Mien in their colorful dresses and adorable crocheted aprons. It was a lot of hugs and kisses, laughter and smiling faces. "Oh, so this is you? This is so cool to meet you live!!!" More and more ladies arrived and in the end we were a good 45 crafty women sitting down outside this cute little café which was the location. Maaike from CreJJtion had made such a great job with flower arrangements, cakes and coffées, lunch buffée and event bags filled with yarny goodness. Thank you Maaike for your fabulous effort on making this an unforgettable event. 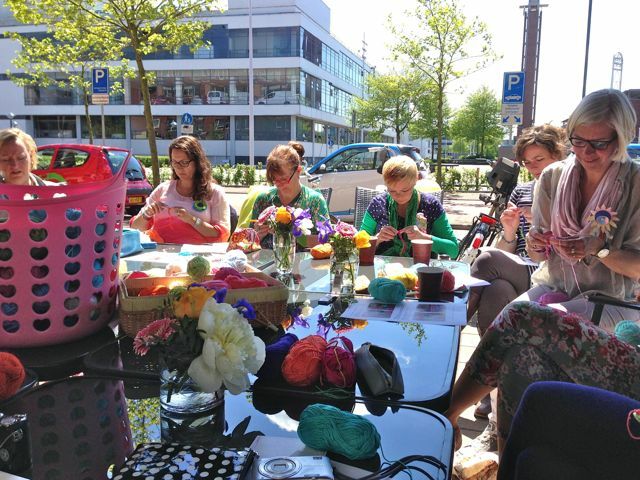 There were lots of yummy yarn, beautiful creations shared, crochet chatting and just a lot of amazement of meeting up in real life like this. I could go on and on about what a great experience this was but I think I put an end to this post here aswell. With a big thank you to everyone attending, every lady I talked to and didn't have time to talk to - it was LOVELY to meet you all and please leave a trail for me to stay in touch as I didn't swop details with each and everyone. Thank you to the lovely Claire, Saskia and Annmarie for their professional tutoring and to Maaike for her flawless organization of this event. I am so hoping for a Create n' Date no 2... Please just say maybe, Maaike. :D That is what I tell me kids when I want them to shut up and stop asking and begging. Ha ha ha. Hi dear Annette, what a beautiful and honorable blogpost you wrote about create n date! Thank you so much. It was so great to have you there too, to meet you and feel instantly connected like a very dear friend. Haha, yes there will be another create 'n date event, I am working on timing and details, also brainstorming about different formats and subjects... Love to hear your thoughts in your email! Also, I am working on the English questionnaire, will send it to you this weekend. And there will be a list of the participants and their contact information. Enjoy the quiet sunny weekend with your family! What a great event. I feel the same way when we go to Geocaching events and meet people in real life that we usually only talk to on line. It's such a great way to make new friends. I'm off to check out your links. Thanks. I LOVE, LOVE, LOVE your blog! Wish I was in Amsterdam right now to see it all for myself! That looks like so much fun! I love the aprons! Oh my gosh, what fun that must have been! Oh how I would have loved to be there too!!!!! 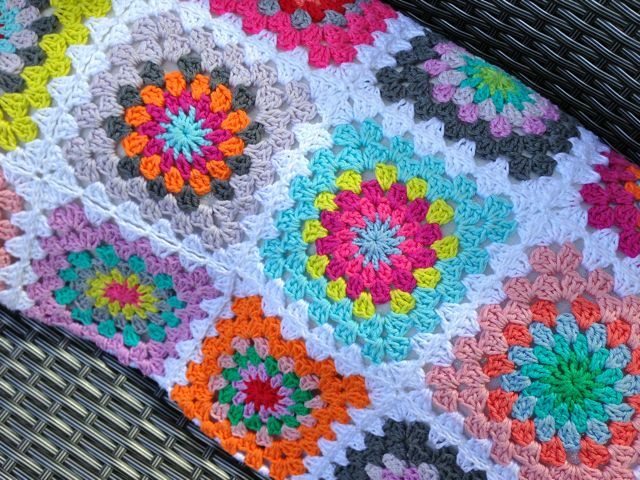 Lovely things, lovely ladies...lovely yarn....= LOVELY!!!! Yes!Yes!yes!..it was such a lovely event! Your pictures are beautiful en shows so right the wonderful atmosphere..♥ And I'm also looking forward to the 2nd Createndate! I really want to be there and hope to see you too! I was there! I was so happy that i could join in. I follow Maaike, Claire, Saskia, Annemarie and YOU for so long now. When i saw you standing there i didnt dare to speak to you. I did not now what to say. I thougt ; OMG! There's Annette... It was so lovely to meet you (eventho we didnt speak, i just listend) Thank you for being there! I hope you share your creations for many years with us. I was there! I'm so glad i could be there. I follow Maaike, Claire, Saskia, Annemarie and YOU for so long now. I saw you standing there and i tought; OMG! There's Annette...! I did not speak with you, i didn't know what to say...i just listend. Thank you for being there and i hope to enjoy your blog and creations for many years to come. Wow what a great day. Thanks for sharing. Lovely photographs of a sun filled day in Amsterdam. It was fun meeting you!